Hi all! 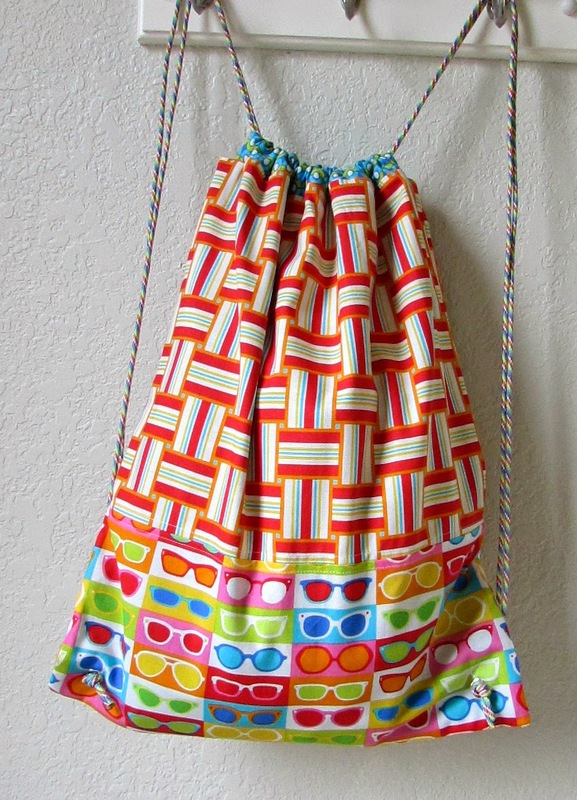 Today I'm going to show you how to make a super easy and fun drawstring backpack! 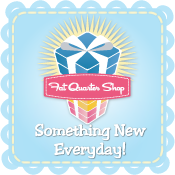 There are lots of tutorials out there, and I didn't reinvent the wheel or anything ;) but I think my version is the perfect size and weight to handle anything I need to shove in it. 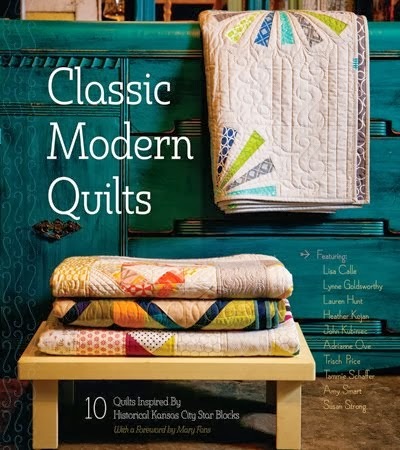 I made mine using Sanibel, a new fabric line by Gina Martin for Moda. 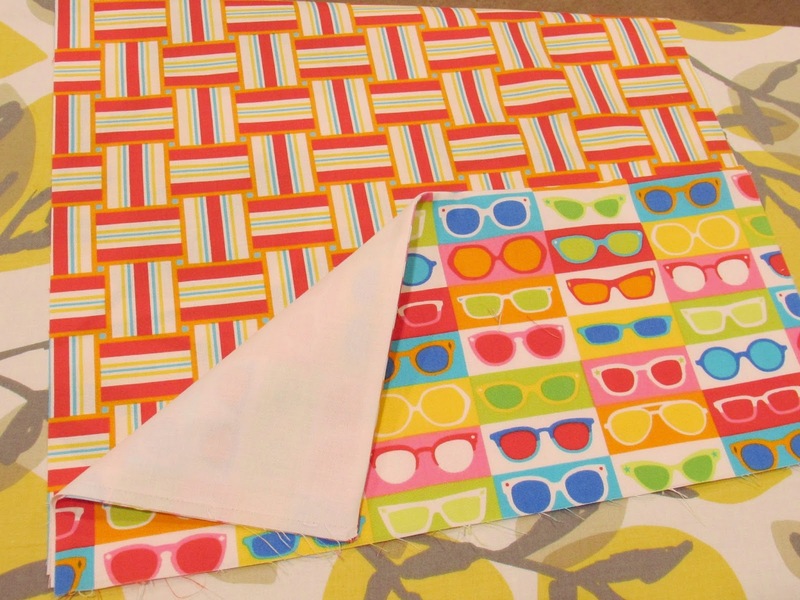 From each of your two fabrics, you will cut (2) 15" x 18" rectangles. (If you are piecing fabric, just make sure you have (2) 15" x 18" rectangles) From your lining fabric, you also need to cut (4) 3" x 14" rectangles. 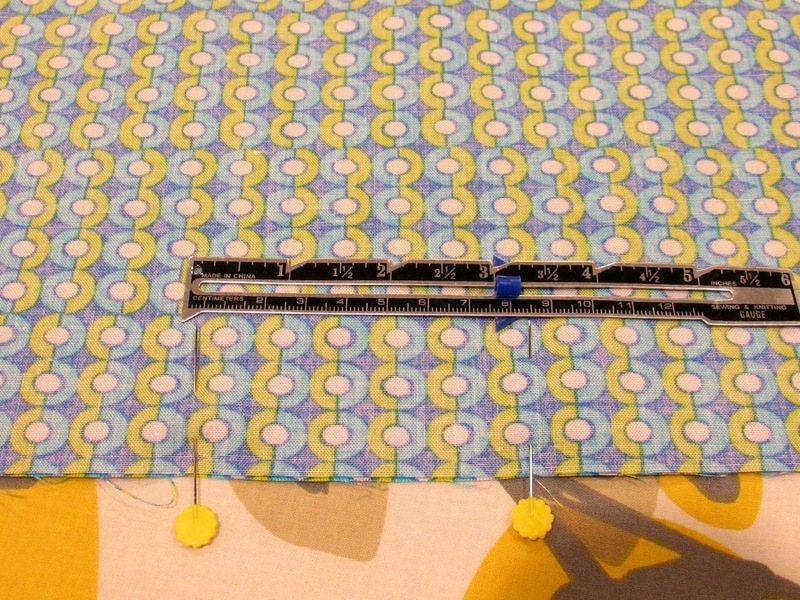 When sewing, all seam allowances are 1/4". 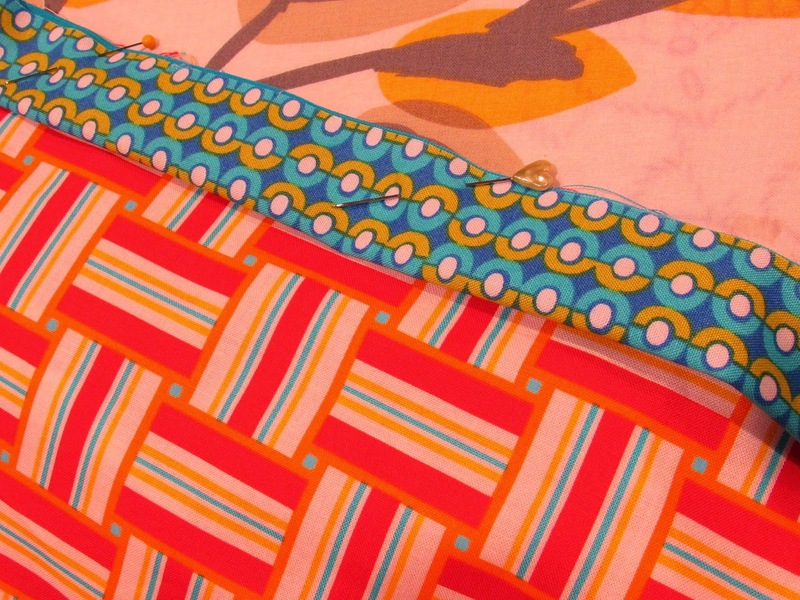 If you are adding a divided pocket, you will also need (2) 7" x 15" pieces (you could adjust this to make a deeper pocket. For example, 9" x 15") I used a print and a white. Sew them together along a 15" side. Press. Top stitch the sewn edge. Pair up two of the 3" x 14" rectangles, right sides together. Sew around three of the sides, starting with a short edge. One of the long edges will be left open. Clip your corners, and turn right side out. I use a chopstick to poke out my corners. Iron flat, and then iron in half, lengthwise. Repeat with the other pair. 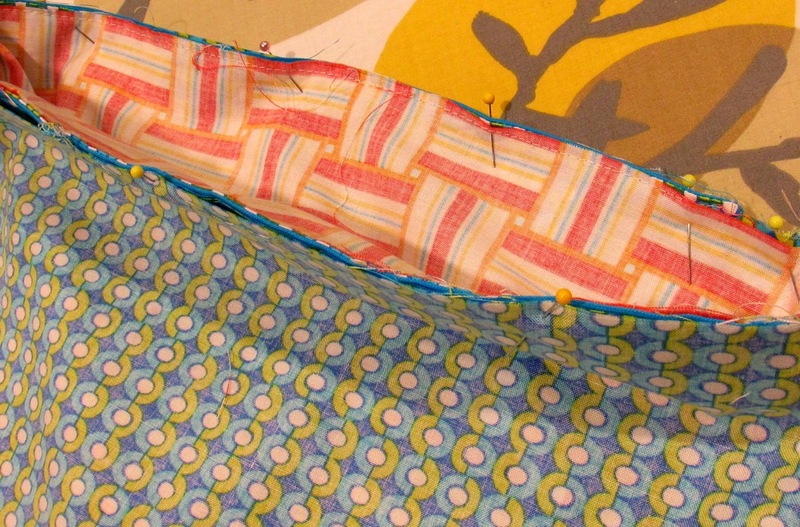 Center your folded piece to the short edge of your outer fabric rectangle. The raw edges need to line up with the bag's raw edges.You will have about an inch on each side of the folded piece. This is the top of your bag, and will become the drawstring casing. 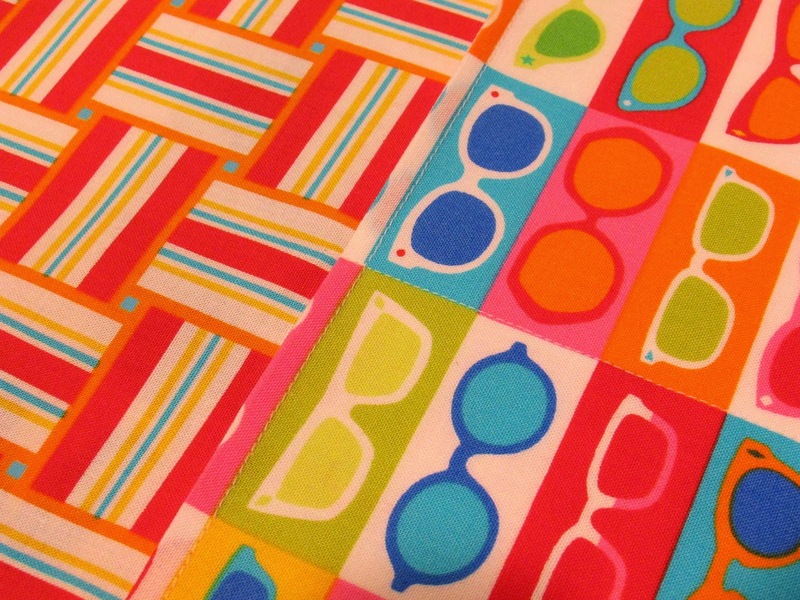 If your fabric is directional, make sure you have the print running the right direction. Pin and baste in place. Repeat with the other side. 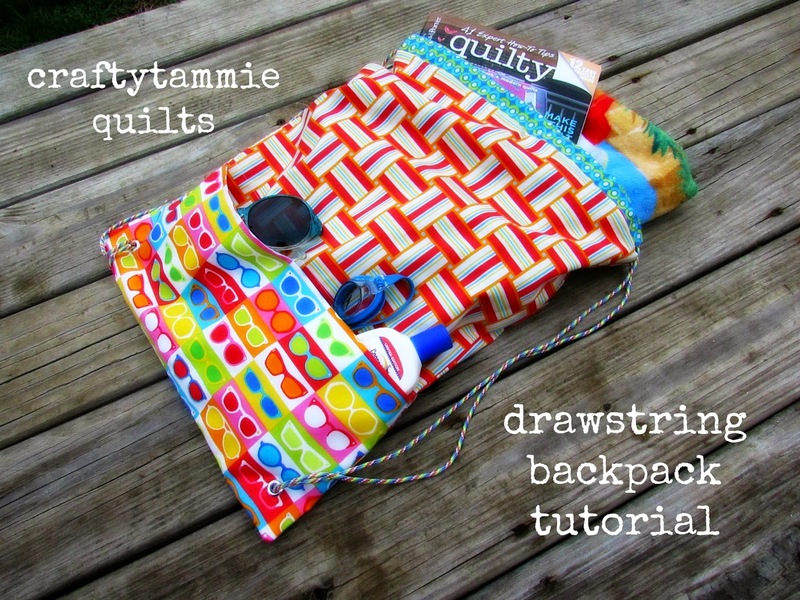 If you're adding a pocket, let's attach it. Center it along the bottom edge of one of your outer pieces, with the stitched edge at the top. Stitch down the center to create the two pockets. I used the print itself as a stitching guide. 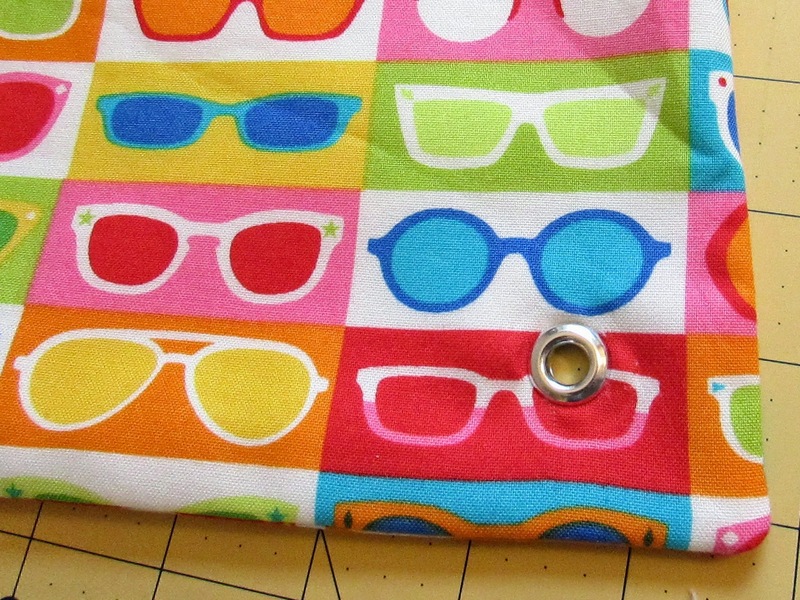 This pocket is deep enough for a pair of sunglasses or a small tube of sunscreen :) If you wanted, you could add pockets to both sides, but you would have to increase the size of your grommet to accommodate the extra thickness of fabric. Place your outer pieces, right sides together, and pin. You will stitch around the two long edges and the bottom edge. Leave the edge with the tabs open. Clip corners and turn right side out. Press. This is the outside of your bag. Take your lining pieces and place them right sides together. 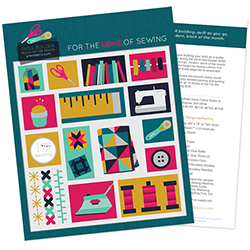 You will sew around the two long sides and across the bottom, BUT you will need to leave a 3 inch opening in the center of the short edge. This is for turning your bag right side out. Clip corners but do not turn right side out. Now it's time for grommets. Measure in about an inch from the bottom corner. Mark the spot by circling inside one of your grommets with a pen. I use an Exacto knife to cut a small x. 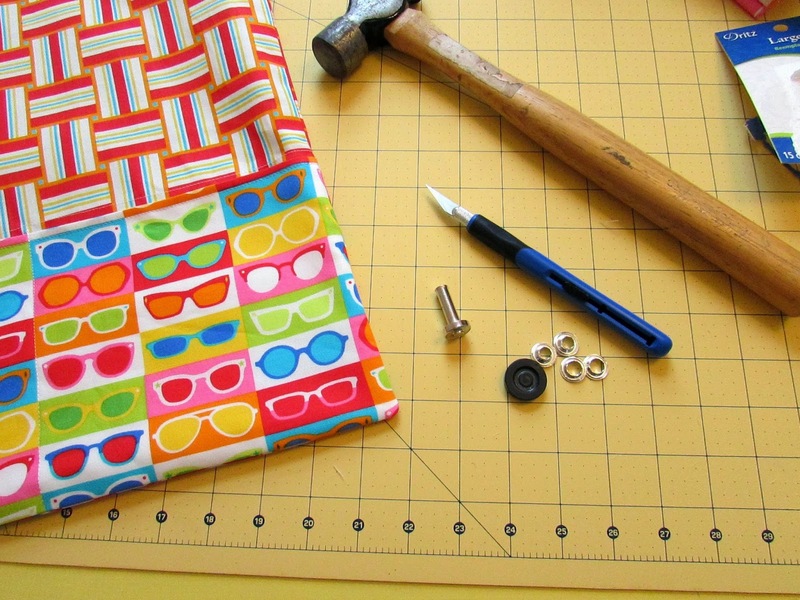 Push your grommet through the hole, top it with the other piece, and hammer it on. Next we do the drawstrings! Use a safety pin and thread through one casing, and back through the opposite casing. Pull both ends through the grommet and tie a knot. Repeat with the second cord, going the opposite direction. All finished! Thrown in a beach towel and your favorite magazine and hit the pool! I've made several of these - we have one in a soccer ball print for all our shin guards and soccer socks. You could coordinate these for all your kiddo's activities! (I'm still looking for a cool wrestling print to make one for the boys' headgear and shoes) Hope you enjoyed it, and if you have any questions just leave me a comment! What a great bag. Perfect for my annual lake cabin excursions. Thanks for the tutorial. The fabrics are GREAT! I love the back pack! 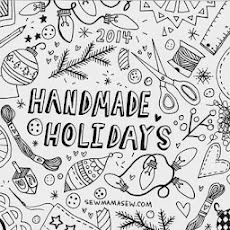 I think I might use this tutorial to get started on some Xmas gifts! I might try to make the bag. Might need more of this Sanibel!! Love it!